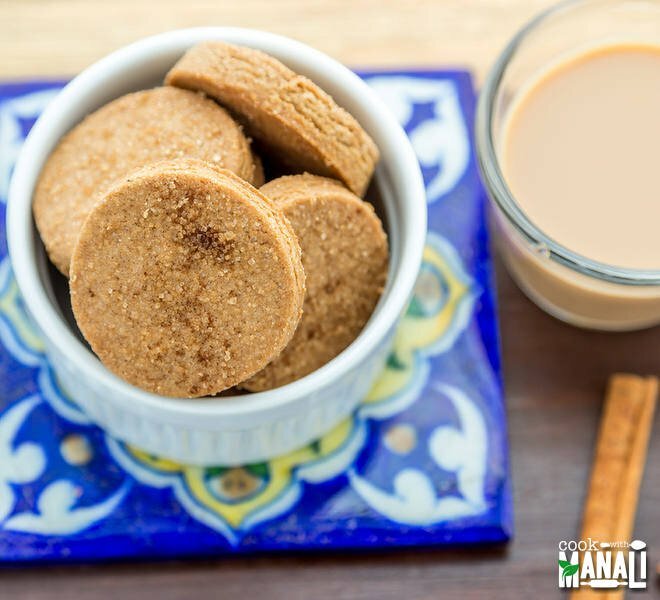 whole wheat cookies, lightly sweetened and flavored with cinnamon & nutmeg. Great for tea time! ½ cup salted butter at room temperature. In a bowl whisk together whole wheat flour, cinnamon powder and nutmeg powder. Set aside. In the steel bowl of your stand mixer fitted with paddle attachment or using your hand mixer beat together the butter and sugar till creamy and smooth. Add in the vanilla and mix. Start adding the flour mix slowly, add in 2 parts beating well after each addition till it's well incorporated. Add milk and continue to mix at low speed till the mixture comes together as a dough. Wrap the dough in a cling sheet and place in the refrigerator for 15 minutes. While the dough is chilling preheat the oven to 350 F degrees. Shape the dough like a disc and then roll it to 1/4 inch thickness. Cut into shapes using cookie cutter. Transfer the cookies onto a baking tray line with parchment paper and sprinkle with cinnamon sugar or turbinado sugar (optional). Bake at 350 F degrees for 20-25 minutes and then reduce the temperature to 300 F and bake for 10 more minutes. Take out the cookies from the oven and let them cool completely.